Double click the slide show for full screen options. All Human Tim+ Robot Tim photos taken by ChiIL Mama at Schubas 1-16-2011. It's free ticket Tuesday again, kidlets, and today our winner is Nicole F. She likes to rock out with her kids to Mindy Hester and the Timeouts and Bari Koral. This Sunday she'll be rockin' out with her kids to Human Tim + Robot Tim at Beat Kitchen! She's won a free family 4 pack of tickets. Nicole, your name will be on the guest list (+3). You could be our next family 4 pack winner. We have tickets to so many great shows this month for adults and kids. Enter for your chance to win tickets to any or all of them. Check out ChiIL Mama's original, fun Human Tim+ Robot Tim video interview, live footage and stills from his January appearance at Schubas between now and the show Sunday. Free For All: We'll even point you toward a free download MP3 of the song, I Like Mice, HERE. 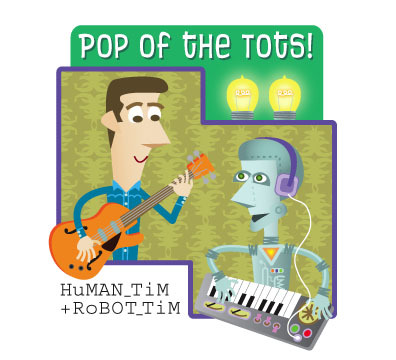 Check in on Win A Disc Wednesdays all month and enter to win a copy of his awesome CD, Pop of the Tots through midnight 3/8. All the March CDs will be up tomorrow. I'm interested in entering the giveaway for the CD, but the link's not working. Looking forward to the show on Sunday!